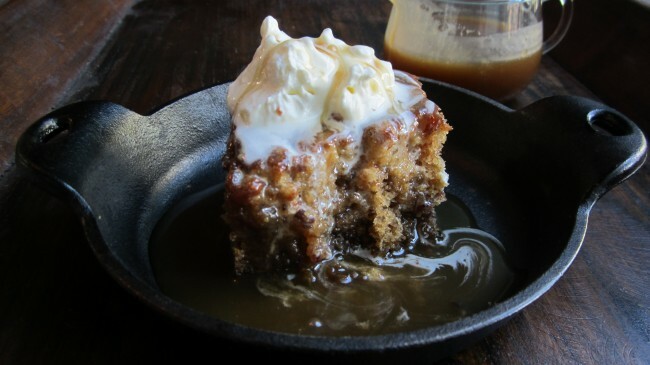 After we returned from the Holiday photo shoot in England, my mind kept drifting back to sticky toffee pudding—the perfect amalgamation of cream, caramel and dates! Since I couldn’t find it on any dessert menus back home, it didn’t take long for me to whip up a version of my own. Without further adieu, I present to you…. Preheat oven to 350 degrees (F). Grease an 8” x 8” square cake pan. In a saucepan over medium heat, combine 1 1/3 Cup evaporated milk (or regular milk), 2 teaspoons vanilla extract, 1/8 teaspoon nutmeg, 1/4 teaspoon cinnamon and 8 oz chopped dates. Bring to a boil, but watch closely so it doesn’t burn or boil over. Boil for a couple minutes, until the mixture thickens and the dates seem nice and soft. Set aside. 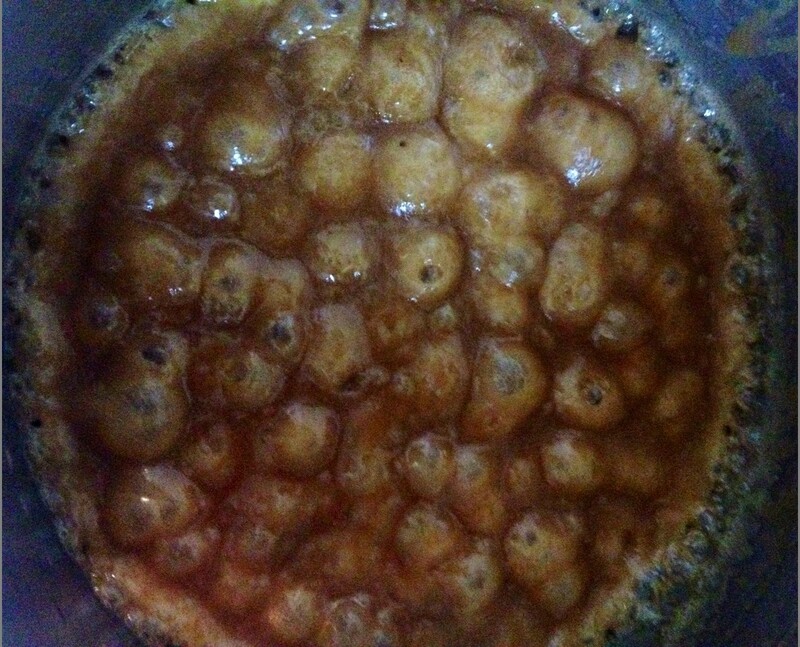 In a large mixing bowl, combine ½ Cup brown sugar, ¼ Cup sugar and 1 stick of butter (1/2 Cup), softened. Beat with an electric mixer for 2-3 minutes, until the mixture is light and fluffy. Add 2 eggs and beat for another minute. Then add 1 ¼ Cup flour, 1 teaspoon baking soda and ½ teaspoon salt, beating just until it’s combined. Lastly, add the date/milk mixture and beat again just until it’s combined. Pour the batter into the prepared cake pan and bake at 350 degrees for about 30 minutes. I start checking after 25 minutes, testing it with a toothpick to make sure it comes out clean. In a saucepan over medium heat, combine 1 stick of butter (1/2 Cup) with 1 cup of brown sugar and a small dash of salt. Once it boils, you’ll want to stir it almost constantly with a wire whisk. Continue boiling for 2-3 minutes, then add ½ Cup heavy cream (whipping cream), without turning off the heat. Return to a boil and let it cook for a minute longer, whisking almost constantly. Finally add 1 tablespoon of vanilla extract just before removing it from the heat. Set aside. Once the cake is done, it only needs to cool for 5-10 minutes before serving. You want it to be warm! While cooling, whip up some fresh cream for the top. All you have to do is pour about ¾ cup heavy whipping cream into a large mixing bowl and beat with an electric beater until thick. When it’s close to the perfect thickness, turn off the beaters and add a small amount of powdered sugar (confectioners sugar), about ½-1 tablespoon depending on how sweet you like it. Keep in mind that the caramel and the cake are both very sweet, so the cream does not need to be as sweet as normal. To serve, cut the warm cake into squares and top individual servings with a heavy stream of caramel and a dollop of cream! Yummy clothes now yummy recipes ! Thanks for the receipe. I have a friend who was born in England and we are always searching for the “best” sticky toffee pudding receipe. I can’t wait to try yours. Please let me know how it turns out, Susanne! When traveling in the UK, stop at Plunkett’s in York. 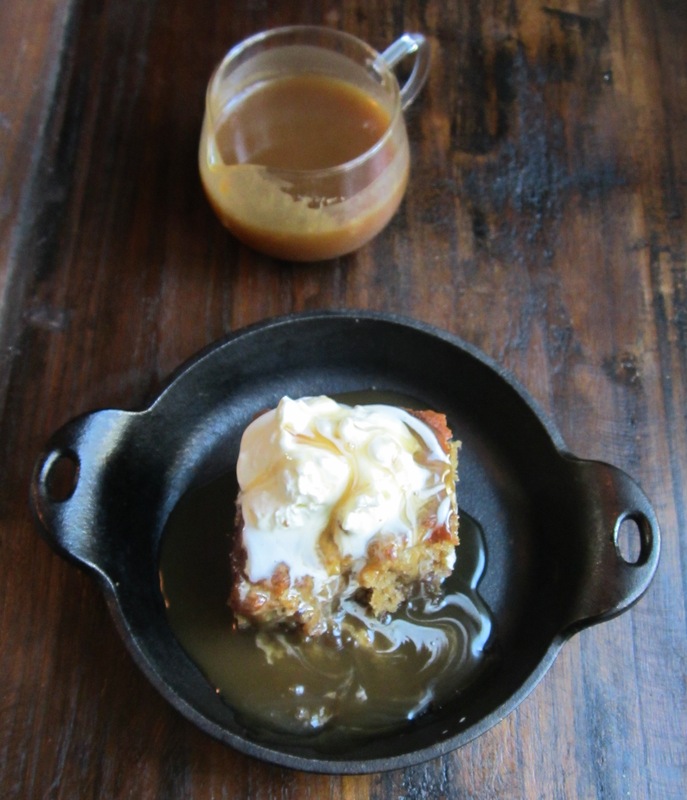 They have THE BEST Sticky Toffee Pudding I’ve found there. Thank you for this recipe. I’m trying it today! Hi Sue, New Zealand would be amazing! 1 stick of butter (1/2 cup) =113.5 grams. Hope that helps! Thank you!! I used to order this from William Sonoma and now I have the recipe!!! Thank you!! I used to order this wonderful dessert from William Sonoma and now I have the recipe!! Thank you so much for the delicious recipe. I made it last night for my husband, his girls and their families. It was a hands down hit. I had a piece left over, guess what I had for breakfast this morning? 5 stars!